When is synthwave not synthwave? When it’s synthpop of course and much of the best synthwave is actually pop. While a lot of synthwave appears to be just formless meandering instrumentals made by gamer boys with a Lamborghini fixation, the majority of the best exponents have been female and tune-based like NINA, MECHA MAIKO and DANA JEAN PHOENIX. 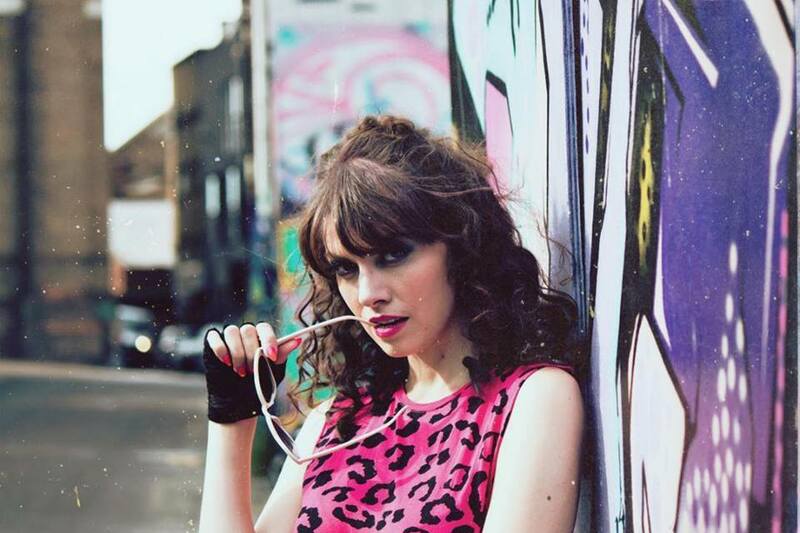 Looking to join that roll of honour is ROXI DRIVE, a talented West London born singer / songwriter and actor with a crush on Ryan Gosling who confesses to “Living my Neon dreams one song at a time” and her debut album ‘Strangers Of The Night’ being “A collaboration of pure synth fusion”. It imagines a world where Madonna Louise Ciccone and Pat Benatar get immersed in the wonders of the synthesizer and doesn’t forget the songs either. Opening number ‘Run All Night (Chase This Dream)’ pulses the night away like a maniac with a neon lit vocal, while the breathy ‘Falling’ recalls the synthpop of THE FRIXION with its various hooks and counter melodies. 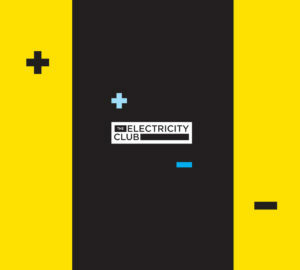 The enjoyable ‘Walking Out Of Love’ borrows from the guilty pleasure of classic Italo disco complete with a Moroderesque vo-coda although whether the variable equalisation on the drums is deliberate or not, it makes for a highly frustrating listen. Production quality also blights ‘Call Me Tomorrow?’ which is a delightful ditty that would have sounded even better with a more sympathetic widescreen mix. 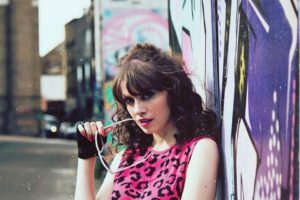 The ‘Strangers Of The Night’ titled song verges into AOR like much of the current crop of synthwave and doesn’t work, but much better is the more synthetically charged pop of ‘All Night Long’. The energetic new wave of ‘Synthicide’ sees a pacier electronic take on ‘Words’ by MISSING PERSONS and might have made it into a John Hughes film if it had been released in 1985, but as it’s a Stacey Q cover, maybe that’s why! Meanwhile ‘See It In Your Eyes’ interludes with a funkier vibe to contrast the album. ‘Behind The Mask’ takes proceedings to a moodier level in a manner not dissimilar to KIRLIAN CAMERA and would go down a treat with the Amphi crowd before ‘Stay With Me’, a marvellous ‘Drive’ influenced ballad with a touch of ELECTRIC YOUTH concludes ‘Strangers Of The Night’. While a promising and varied record, some of its production is unable to fully exploit the potential of the material, with an inconsistent sound that lacks clarity. Meanwhile, some of the vocal effects are also perhaps too overbearing at times in an attempt to get things heard over the busy backing; seven producers of varying experiences appear to have been credited on the album which could account for this. 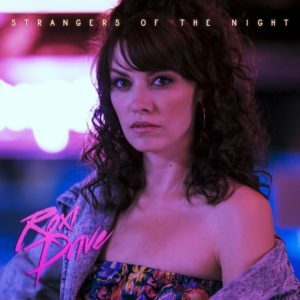 While much of this long player could have been more sonically accomplished, what ROXI DRIVE has proved with ‘Strangers Of The Night’ is she can write songs. Coupled with the right studio team, she could be up there in the future with the best of the current crop of independent synth-based artists.